According to the Dodge Construction Outlook total construction starts increased 4 % in 2014, and a 9 % increase is forecast for 2015, while the vast majority of construction and design firm executives believe the market is stable or growing. Due to the positive development we have steadily increased our cover for this industry over the past few years. However, it must be said that the construction market rebound still lags behind the overall economic recovery that began in 2009. Downward pressure on businesses´ revenues remains, and increasing salaries, healthcare costs for staff and miscellaneous expenses continue to tighten margins. Banks are principally willing to lend to the construction industry, but only for viable and promising projects. However, as the commercial and residential development markets strengthen, the construction sector´s financing climate is improving. Given the positive growth prospects for the industry, we expect notifications of late payments to level off in 2015. Construction insolvencies have continued to improve overall in the US last year. However, small businesses in the industry are generally still paying later and have higher bankruptcy rates and delinquent debt than other industries. But the decreasing trend is expected to continue throughout 2015. Our outlook for the overall consumer durables sector should be viewed as mildly conservative. 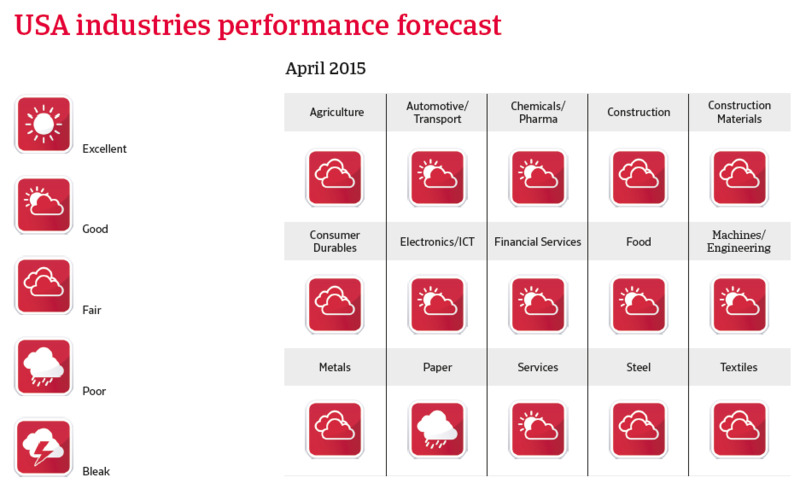 Specific industry subsectors may be viewed more positively than others. Although the recovery of the US housing market has been slower than expected, it is still sufficiently strong to benefit home products companies, which generate about half of the consumer durables retail sector´s revenue and operating profit. The outlook for household appliances remains positive in 2015. However, despite the principally good outlook for consumer durables retail, there is always the risk that sales prices may suffer if demand unexpectedly slows and competition intensifies. And while high earners continue to spend, thanks to gains in the housing and equity markets, many middle-income consumers still remain cautious, partly due to the rising food and healthcare costs. Increased competition and continued margin pressure. Despite the general upswing, the consumer durables retail sector continues to be characterized by increased competition and continued price and margin pressure. Therefore, businesses within the industry should be carefully evaluated and liquidity should be closely observed. Payments take 90 days on average, and we noticed increasing non-payments in the last couple of months. However, we do not expect them to increase further in the coming months. Insolvencies have decreased in 2014 due to better performance, and are expected to level off in the coming months. At the end of 2014 the performance outlook for financial services has been upgraded from “Fair” to “Good”, as banks benefit from decreasing business and non-business bankruptcy cases, leading to fewer write-offs by financial institutions. End of 2014 the performance outlook for food has been upgraded from “Fair” to “Good”. Consolidation in the sector is on-going, and most of the major companies have diversified and/or established large market shares in their key product offerings. On average, payments in the US food industry take 30 days, and the level of payment delays and insolvencies is expected to remain stable in 2015. For the food sector overall, our underwriting policy is relaxed, although we take extra care with subsectors that may feel the impact of commodity prices on their production costs, as this will determine the price paid by consumers and consequently the level of demand. Payments in the US food industry take 30 days on average. In January 2015 the performance outlook for textiles has been updated from “Poor” to “Fair”, as many businesses in this industry have shown improved cash flow generation and balance sheets while profits are increasing. Textile producers and retailers benefit from lower commodity prices (e.g. cotton), and sales are expected to grow further in 2015, up 2%-3%% in the clothing retail segment. Carpets and home furnishings businesses are expected to increase sales by 3%- 5%. Steel and metals businesses continue to benefit from the rebound in automotive and construction, with steel sales expected to increase by more than 3% in 2015. Metals service centres profit margins have been generally stable between 3%-5% over the past few years, and we expect this trend to continue. Those businesses typically keep their inventory levels within 60-90 days of supply, with many placing orders on a ‘just-in-time’ basis in order to keep overhead costs at a minimum. Smaller players dependent on the oil sector are struggling. However the sharp decline in oil prices has an adverse effect on steel and metal businesses dependent on the oil and gas industry, e.g. the Oil Country Tubular Goods (OCTG) segment. Especially many smaller players are now struggling as decreased investment is impacting their projects to the extent they may no longer be profitable. In the long term the decreased demand from the energy sector could have a major impact on a large share of the steel/metals industry. Therefore our underwriting stance remains cautious. 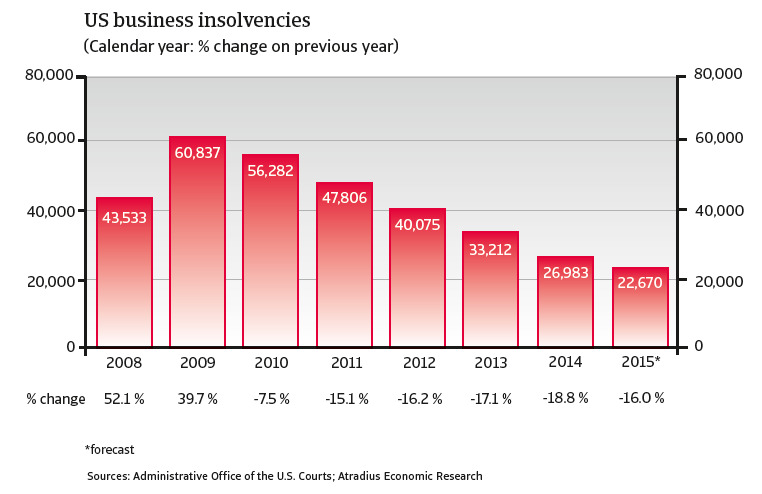 After year-on-year increases of more than 40% in 2008 and 2009, the number of corporate insolvencies has decreased steadily each year since. According to the latest figures provided by the US Courts, the number of business bankruptcies filed in federal courts declined 18.8% year-on-year in 2014, to 26,983 cases. We expect this positive downward trend will continue in 2015 due to the expected continuation of the economic recovery (see economic report overleaf). US corporate insolvencies expected to decrease further in 2015. The US economy grew 2.4 % in 2014, but a surge in growth of 3.0 % is expected in 2015, followed by growth of 2.7 % in 2016. The acceleration of growth in 2015 is forecast to be based on robust private spending and increasing investment and net exports. Consumer confidence increased considerably in 2014. By the end of 2014 and into early 2015, consumer confidence had increased to its highest level since July 2007 (see chart below). 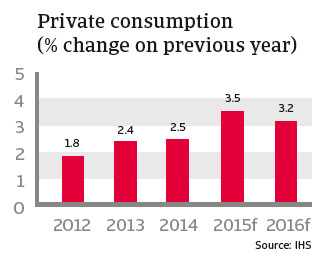 Private consumption rose 2.5 % last year, following a 2.4 % increase in 2013. In 2015 a robust 3.5 % increase is expected. Consumer wealth has been boosted by increasing home prices. The collapse in house prices was one of the causes of the 2008 financial crisis. Prices began falling in 2006 and did not stabilise until 2009. The recovery in prices started in early 2012 and continued into 2014. House sales are still benefiting from lower prices in many areas and low mortgage rates. Home owners who have seen their equity rise will be more likely to borrow and spend while, at the same time, delinquency rates should stabilise. Household finances continued to improve in 2014, with consumers reducing their debt and improving their debt-to-income ratio. Net wealth is also better, thanks to both lower debt and higher asset values, on investments such as housing and securities/stocks. This provides a solid foundation for further improvements in consumer spending growth. 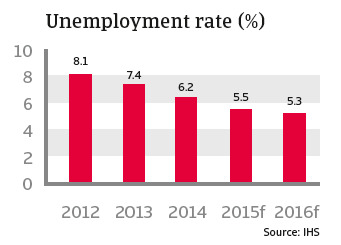 The unemployment rate decreased to 6.2 % in 2014 and is expected to decline further to 5.5 % in 2015. This is another important push factor for rising consumer confidence and spending. The US consumer price index has decreased since mid-2014 as a result of declining oil prices, and is forecast to fall to 0.0 % in 2015 after 1.6 % in 2014. The decrease in oil prices is, on balance, positive for the US economy. Due to a strong increase in production over the past couple of years, the US is currently self-sufficient in oil. While the lower oil price reduces profits of producers, it benefits consumers, who are more likely to spend the extra money. While the US Federal Reserve (Fed) has decided to keep the benchmark interest rate low for the time being, it is expected that the Fed will raise the currently low interest rate of 0.25 % this year, possibly as early as June, as the US economic rebound gains momentum. However, this could dissuade consumers from taking on more debt in order to fuel spending, and therefore impede private consumption growth to a certain extent. After falling 11.4 % in 2009, US industrial production rebounded from 2010 to 2013. 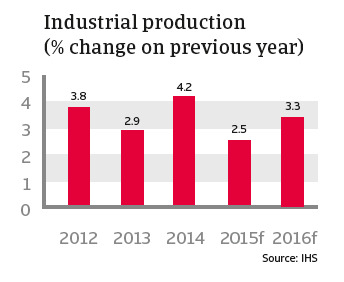 Following a robust growth rate of 4.2% in 2014, industrial production growth is forecast to slow down somewhat, to 2.5 % in 2015 and 3.3 % in 2016.
Business confidence in the manufacturing industry increased through the first half of 2014, but fell again towards the end of the year. However, it remains at an elevated level (see chart below). 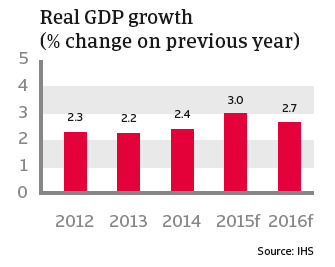 Investment growth surged in 2014 and is forecast to grow above 5 % in 2015 and 2016. US exports decreased towards the end of 2014, partially due to the fact that the increasing the USD hurts US exporters’ international competitiveness. If this continues, exporting the US may see their profit levels decrease further. The US current account deficit, GDP in 2014, is forecast to decrease to 1.6% of GDP in 2015. The continued improvement current account is largely the result of the energy revolution in the US, as large-scale shale oil and gas greatly reduces the need for energy imports. 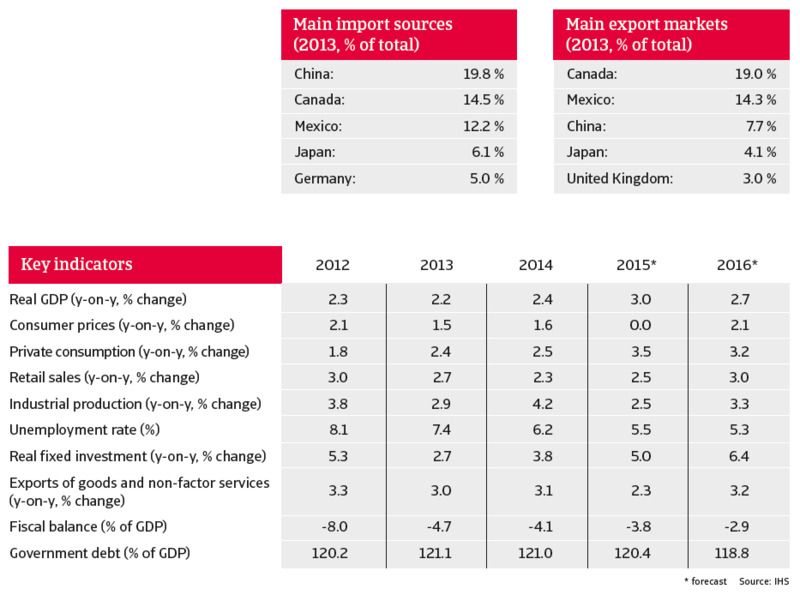 US exports decreased towards the end of 2014 , partially due to the fact that the increasing strength of the USD hurts US exporters’ international competitiveness. If this continues, exporting companies in the US may see their profit levels decrease further. The US current account deficit, which was 2.2 % of GDP in 2014, forecast to decrease to 1.6 % of GDP in 2015. The continued improvement of the current account is largely the result of the energy revolution in the US, as large-scale exploitation of shale oil and gas greatly reduces the need for energy imports. As a result of the 2008 financial crisis, both government debt and the budget deficit increased sharply from 2009 to 2011. 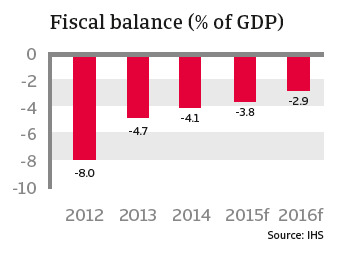 After reaching 4.1 % of GDP in 2014 the budget deficit is expected to decrease in 2015, to 3.8 % of GDP, and further in 2016, to 2.9 % of GDP. However, government debt remains high, at 120 % of GDP.